A funeral mass is scheduled for 9:30 a.m. Saturday, May 27, at Our Lady of Grace Catholic Church for Gonzalo S. Montoya of Lake Arthur. 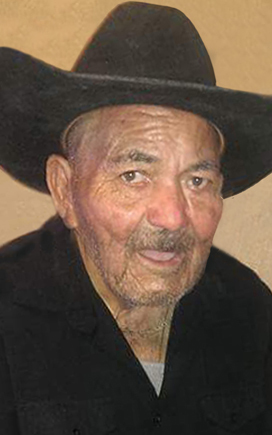 Montoya, 81, joined the Lord Monday, May 22, 2017, in Artesia. He left peacefully, surrounded by family. Fr. Frances Lazer will officiate at the services, with interment to follow at Woodbine Cemetery. Pallbearers will be Gabriel Montoya, Chris McNeil, Tootie McNeil, Danny Montoya, Jeremy Montoya, Thomas Baeza, Gonzalo Montoya III and Juan Ramon Valenzuela. Honorary pallbearers are the rest of his children, grandchildren and great-grandchildren. Visitation will begin at 1 p.m. Friday at Our Lady of Grace. A rosary will be recited at 6:30 p.m. Friday at the church. Gonzalo was born Jan. 10, 1936, in Mulato, Chihuahua, Mexico, to Ignacio and Teodora Montoya. On Jan. 17, 1956, he married Patricia Valenzuela in Presidio, Texas. The couple shared 60 years of marriage. Gonzalo was a farmer, and his passion was riding and training horses. He was extremely content being surrounded by his family, grandchildren, great-grandchildren and friends. He loved to listen to music. Survivors include his children, Mary Pasillas of Roswell, Lupe Baeza of Lake Arthur, Juanita Aguilar of Cottonwood, Rosa McNeil and husband Richard of Silver City, Gonzalo Montoya Jr. and wife Diana of Hagerman, Abel Montoya, Javier Montoya and Danny Montoya, all of Lake Arthur, and Gabriel Montoya and fiancée Ashley of Artesia; brothers Apolonio “Mon” Montoya and Francisco “Frank” Montoya and wife Julia, both of Ft. Stockton, Texas; sisters Ramona Alvarado and husband Efrin of Presidio, Texas, and Manuela Valenzuela and husband Ramon of Kermit, Texas; 22 grandchildren; 51 great-grandchildren; and close friends Juan Muniz, Rodrigo Quintana and Ignacio Romero Sr. He was preceded in death by his parents, Ignacio and Teodora; his beloved wife Patricia; daughters Natalia and Gloria; brother Delores “Lolo” Montoya; and sister Carolina Ortiz.